Unlike other sports which select 2-3 teams of all-stars and then honorable mention, in cross country we only pick All-Division; the top ten in each Division 1, 2, and 3. This is a rather select group, and of this group, we then select an overall top 10 to comprise the NH All-State. So if your name is simply listed, you have accomplished something incredible! Congratulations! All of the awards, including Team of the Year, Coach of the Year, and Runners of the Year, will be presented at the 18th Annual NH All-Star Banquet, December 9th at The Executive Court Banquet Facility (formerly The Yard) in Manchester. We are extremely thankful to Millennium Running for their sponsorship of the banquet this year. 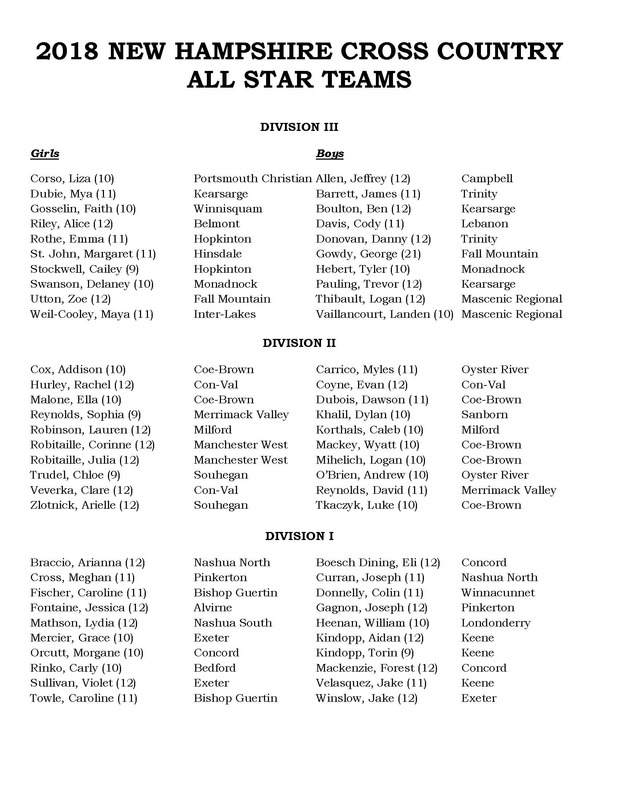 Posted below is list of All-Division, the printable program, as well as the ticket information form. Next post THANKS NH CROSS COUNTRY COMMUNITY!! !